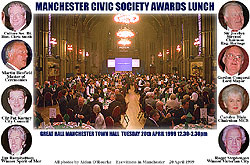 THE MANCHESTER CIVIC SOCIETY AWARDS LUNCH took place today in the Grand Hall of the Town Hall. I was there with my camera to capture the proceedings. Master of Ceremonies was BBC TV presenter Martin Henfield. VIP guests included Sir Jocelyn Stevens, Chairman of English Heritage, and cabinet minister Chris Smith, Secretary for Culture, Media and Sport, who presented the prizes. 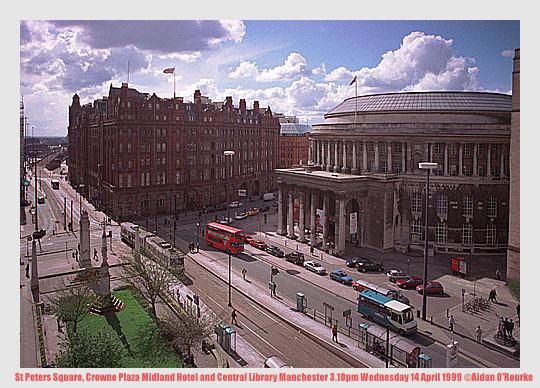 It was an auspicious and enjoyable event which demonstrated the extraordinary success of the Manchester Civic Society in bringing people and organisations "on board". Their latest convert is their former adversary Manchester City Council, soon to become a corporate member of the Society. Eyewitness in Manchester didn't win the Spirit of Manchester Award, but my pictures were used on a projected computer display. See them, with a list of the winners, on my Civic Society Awards page. The awards are sponsored by Norweb and the Manchester Evening News. THE MANCHESTER EVENING NEWS has been named north west daily newspaper of the year. Reporter Mikaela Sitford won the title "North West Daily Journalist of the Year". The honours were handed out at the BT Awards Ceremony, which took place at Reebok Stadium near Bolton. PRINCESS ANN THE PRINCESS ROYAL was in town on Wednesday. In the morning she visited "Route 53", a pioneering project based in Cheetham Hill which helps teenagers at risk of getting involved in crime. 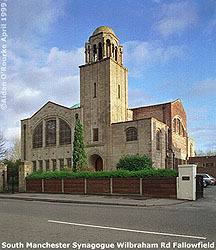 Later she visited Manchester High School for Girls and continued on to St Ann's Hospice in Salford. PRINCE CHARLES VISITED TWO CONTRASTING SCHOOLS in Manchester on Thursday. Manchester Grammar, reputed to be the city's top boys grammar school, and Ducie High, an inner city comprehensive have a partnership arrangement. MGS boys help Ducie High School pupils with exam technique and in return Ducie pupils help MGS pupils with sport and out of school activities. Prince Charles is all in favour of such partnership arrangements. As for the city's top boys school, well, it has to be Xaverian College, pre 1977. That's where I went! METROLINK OPERATORS ALTRAM have found the ideal solution to the problem of the missing tram line to the Trafford Centre: It's a bus - well, a fleet of sixteen buses, which will operate between Stretford Station and the Trafford Centre - a journey of 16 minutes. 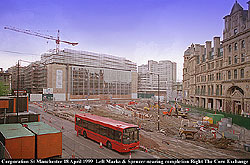 A bus will meet every tram after the morning rush hour and take shoppers to the gargantuan shopping and leisure complex. GM BUSES NORTH has banned ten of its bus services from Churchill Way Pendleton following attacks by youngsters. Now, local residents will have to walk up to Broad St and cross over the other side if they want to take a bus into Manchester. Over the last nine months there have been thirty incidents of bus windows being shattered by youths throwing stones from the pavements. It's a good example of how the mindless behaviour of a few thugs can cause irritation and inconvenience for thousands. 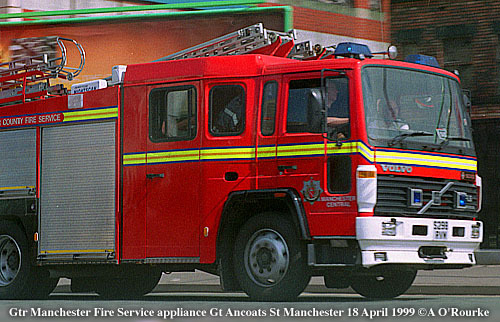 GREATER MANCHESTER POLICE was 25 years old last week. The force was formed at the same time Greater Manchester County was born in April 1974. Policing landmarks over the first 25 years include the 1985 plane disaster at Manchester Airport, the evacuation of Manchester City Centre after the IRA bomb in 1996, and the visit of Pope John Paul to Heaton Park in 1982. Drugs and drug-related crime take up a large amount of police time and resources nowadays. Racism is another burning issue that police have to deal with. Home Secretary Jack Straw has told police forces throughout the United Kingdom to recruit more ethnic minority officers, such that each police force will reflect the ethnic make-up of the community it serves. The Greater Manchester force currently has 6,890 policemen and policewomen. Only 166 are from an ethnic minority. I've seen black and Asian bobbies, but I don't remember seeing a Chinese or east Asian one. 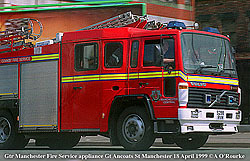 Here's a Greater Manchester Fire Service fire engine on Ancoats St - I wonder if they're celebrating their quarter century as well. SCUBA THE SNIFFER DOG WAS SENT INTO ACTION at Bramhall High School yesterday in order to uncover drugs. Two 15 year old pupils were found with cannabis, and suspended but not expelled. The action was authorised by Headmaster John Peckham and the school governors, and has aroused some controversy. Civil Rights campaigners have criticised the "raid" because they said it sends out the wrong messages. It was also thought the presence of a dog may upset some of the younger children. The headmaster defied local education and health authorities, and it seems he may have some support: 99% of respondents to yesterday's MEN poll said he did the right thing. MANCHESTER'S "HANGING BRIDGE" will form the centre piece of a new visitors centre to be opened in Hanging Bridge Chambers, which sits on top of the bridge, next to Manchester Cathedral. Archaeologist Robina McNeill gave a talk for the Manchester Civic Society last Wednesday on the subject. The visitors centre, due to open the year after next, will become a big attraction in the reconstructed city centre, currently taking shape, as we can see in the pictures below. UMIST IS 175 YEARS OLD this month. It started as the Mechanics Institution in 1824. In 1856 it was housed in the Mechanics Institute, on Princess St. In 1892 the city took over full responsibility. The present main building was completed in 1898, and an extension was opened in the 1950's. 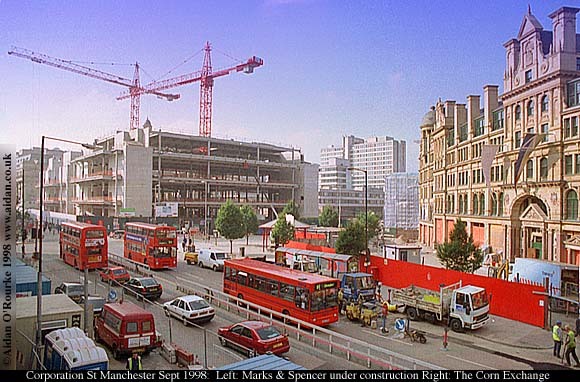 In the sixties it expanded southwards across the River Medlock and up to the Mancunian Way. 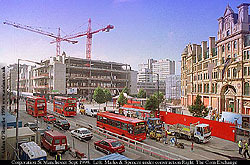 Umist has 6500 students, many of them from overseas. BURY WILL GAIN 2000 NEW JOBS thanks to mobile phone company Cellnet who are opening a new call centre on Dumer's Lane. The new centre will start up in June and will be fully operational by October. The local accent was an important factor in the company's choice of location. Company spokesman Damian Peachy said "We have done some research into regional accents and we found customers liked and trust the Manchester and Lancastrian accent. They feel it's down to earth and empathic" And Stockport will gain 500 new jobs when the Swedish furniture store IKEA opens a new outlet in a retail park in Portwood. A FILIPINO WIFE AND MOTHER who wants to return to the UK to live with her husband and family in Crumpsall has been told by the British Embassy in Manila that she will not be allowed to come here. Norma Scallon lived with husband Brian Scallon, their son , 3 and her daughter from a previous relationship, Michelle Ricablanca. Two years into marriage, the couple had marital problems and she decided, very unwisely as it's turned out, to return the the Philippines. Since then the couple have been reconciled, but unfortunately there are visa difficulties: normally couples have to live together at least 12 months before the spouse from overseas is entitled to permanent residence - she left the UK several months short of this period. The family are very disappointed, and will to lodge an appeal. They have the backing of Blackley MP Graham Stringer. 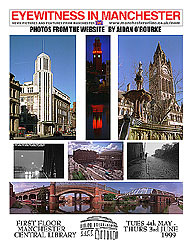 MANCHESTER HAS BEEN FEATURED ON TV a few times this week. BBC1's Watchdog on Thursday at 7pm came from the Trafford Centre, and on Sunday, Antiques Roadshow was recorded at Chetham's Library, where contestants had to guess the prices of old books from the library - the amounts were in five figures!. Tatton Park and the Cafe Pop were also featured in the programme. Ex-Key103 DJ Steve Penk is becoming one of the UK's top TV presenters, with his "wind-up" show shown at 6.10pm on Saturday "Would I Lie To You". And later in the evening he returned with "The Way They Were", which showed old footage of today's stars as they were 10 or 20 years ago. One of the items was the first TV appearance of Mrs Merton in 1991, on the Granada local show Up Front - she looked hardly any different from today. They also showed film of a red-checked Mick Hucknall at a concert by the band Magazine, whose front man was Howard Devoto, co-founder of the Buzzcocks. 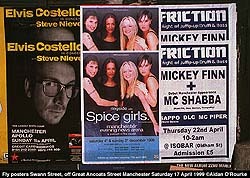 I went to a concert by Magazine around that time, though I didn't notice myself in the clip though! THE EYEWITNESS IN MANCHESTER EXHIBITION will be on at Manchester Central Library from the beginning of May - I'm currently preparing the pictures for display. The exhibition will be on the first floor next to the new Internet centre, which offers free Internet access to residents of the City of Manchester. Here's the poster, which I just completed today. Hope you can make it! MEN REPORTER Jaya Narain and Central Manchester MP and Foreign Minister Tony Lloyd have been seeing relief workers in action in Macedonia. Daily reports from Jaya Narain in Skopje, capital of Macedonia, have given a local insight into a humanitarian crisis of world proportions. Residents in Greater Manchester have raised more than half a million pounds since the MEN launched its Kosovo appeal. A group of women in Leigh have set up a project to supply toiletries to the Kosovan refugees. People can call into local stores, who have given their support, and drop off items which will be shipped to the refugees. A group of enterprising Urmston residents have set up another major aid project. The Manchester Aid Project for Kosovo Refugees Appeal started off when a group of people met at the Britannia Inn at Urmston and decided to do something about the crisis they saw on TV. Fourteen lorries will set off this Friday loaded with aid, including blankets, sleeping bags and other things the refugees need. The address for donations is The Britannia Inn, 21 Flixton Rd, Urmston, M41 5AW cheques to Kosovo Account Flixton Fellowship or contact Chris Mullarkey 0161 747 4860. There's huge amounts of local goodwill being shown towards the refugees, but in Thursday's MEN poll, 88% said it was time to stop the bombing. A NEW HOLOCAUST MUSEUM is to open next to the Imperial War Museum for the North. The "Shoah Centre" will help to keep alive the memory of the Jews exterminated during the Second World War. "Shoah" is the Hebrew word for holocaust. Britain and in particular Manchester is to be praised for offering sanctuary for people from other parts of the world, particularly Jews expelled from Europe during this century. Driving through parts of Higher Broughton, and seeing Ashkenazy Jews with their black hats, suits, beards and ringlets, you'd think you were transported back to pre-holocaust central Europe. And just a short drive into Cheetham Hill, and you're in Pakistan! That's Manchester, a whole world in one city. FIRE KILLED AN ELDERLY COUPLE at their semi-detached house on Briarlands Avenue, Sale early yesterday. And another tragedy occurred only a short distance away on Park Road Timperley. School crossing patrol warden or "lollipop lady" Margaret Steindorff died from her injuries after being hit by a car outside St Hugh's Roman Catholic Primary School. Wherever you are please take care when driving or crossing the road. A MAN WAS FOUND DEAD in the Ashton Canal near Pollard St on Wednesday. He had been stabbed several times. Police indentified him later as John Gordon. They are appealing to the public for information. A MANCHESTER MAN who lost his family in the Waco inferno has written a book warning people about religious cults. The book: "The Naked Truth About Cults" was published yesterday, exactly six years after 86 cult followers lost their lives when the Branch Davidian headquarters went up in flames. ON THURSDAY fans in Liverpool and elsewhere remembered the victims of the Hillsborough disaster. Ten years ago 96 fans from Liverpool died in a crush of people at the Hillsborough Stadium in Sheffield. The pain of the tragedy continues in the hearts and minds of people in Liverpool to this day. The song "You'll Never Walk Alone" has become a memorial to those who lost their lives. MANCHESTER UNITED CHAIRMAN said in no uncertain terms "I Stay" on the cover of Saturdays' MEN. He said a silent majority of fans had been in favour of the takeover, and told top MEN sports journalist Stuart Mathieson of his shock and disappointment at the decision to block the takeover by BSkyB. "THE GREATEST GOAL EVER SCORED" was how the MEN front page on Thursday described the goal by Ryan Giggs, taking Manchester United to the Cup Final . They will play Newcastle United on 22 May at London's Wembley Stadium. Tickets are going to be like golddust. And Manchester United have banned one of their fans from attending matches after it was revealed his ticket had been sold by a ticket tout. FOOTBALL RESULTS: Manchester City-2 Luton Town-0, Arsenal-1 Manchester United-2 after extra time. Manchester United-3, Sheffield Wednesday-0, Bolton-2 Ipswich-0, Rochdale-3 Chester-1, Grimsby-0 Bury-0, Millwall-0 Wigan Athletic-1, Wrexham-1 Oldham Athletic-2, Gillingham-0 Manchester City-2. Rugby League: Warrington-14 Bradford-22, St Helens-39 Sheffield-30, Salford-14 Huddersfield-15. PERFORMANCES THIS WEEK included Günther Herbig conducting the Halle Orchestra at the Bridgewater Hall, "Martha, Josie and the Chinese Elvis" at Bolton Octagon, "East Access' at the Green Room, Elvis Costello at the Manchester Apollo, the Royal Liverpool Philharmonic Orchestra at the Bridgewater Hall, "Never the Sinner" at the Library Theatre and the Bucharest String Duo, Manchester Cathedral. DRAG QUEEN FRANK "FOO FOO" LAMMAR had an accident on Oldham Street last Wednesday. His Rolls Royce smashed into railings on the corner of Oldham St and Lever St. Foo Foo Lammar has a night club on Dale Street, round the corner from Newton St, off Piccadilly. 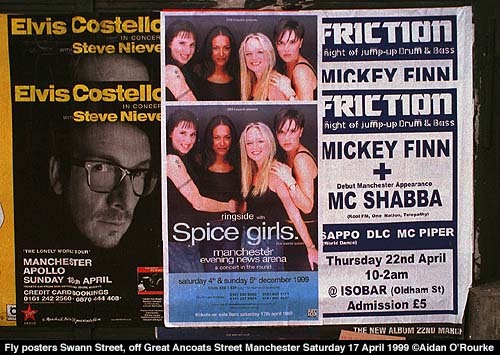 This used to be "The Ranch", Manchester's first punk rock night club. I remember going there during my "Buzzcocks" days in 1977. I once interviewed lead singer and songwriter Pete Shelley at the Russel Club in Hulme, where I saw another seminal Manchester band: Joy Division. WINTER RETURNED TO THE NORTH WEST this week. Snow fell on the Pennines - The Snake and Woodhead Passes were closed on Friday night and there was sleet on the M62. Sunday was alternately cloudy, sunny and rainy with very cold temperatures. Yesterday afternoon was very pleasant with large billowing clouds, but today was cold and drizzly. I didn't bother to take any photos outside today. If you want an indication of what today felt like, click on the rainy image from the archive, right. But today's highpoint was undoubtedly the Civic Society Awards - please have a look at my Civic Society Awards page, if you haven't done so already. Thanks for visiting and see you next week!